Here is a good and comprehensive tabular summary of how increases in global temperature of 1.5 C, 2 C and beyond will affect a wide variety of weather and climate events, including sea level rise, heat waves, average and extreme temperatures and rainfall, and crop yields as well as other variables. A lot to take in, but a good summary of what we and our children are going to have to deal with in the future. You can see it at https://interactive.carbonbrief.org/impacts-climate-change-one-point-five-degrees-two-degrees/. 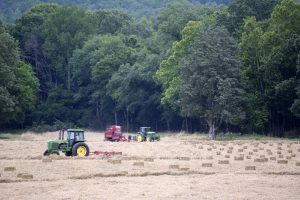 A trio tractors rake, bale and collect straw at Scoggins Farm, a family farm on West Armuchee Road in South Walker County, Ga., on June 1, 2017. Plentiful rain so far this spring has fostered a far better growing season so far, local agriculture officials say.